A floor light that will last throughout college & beyond! It's only natural to want a well lit college dorm room. There are so many different forms and styles of dorm room lamps to choose from when it comes to deciding how to light and decorate your college dorm room. Our Natural Body Wood Floor Lamp is a simply way to give your dorm room a lot of style and even more lighting. The unique wood accent on the stem of our dorm lamp will bring a little of the outdoors into your dorm room. Rustic decorative touches always give dorm rooms a more comfy cozy look which can be sometimes be hard to create. With a height of 61'', our dorm room light will make a huge addition to your college dorm room's decor without taking up valuable floor space. Most college dorm rooms have florescent lights that are harsh and ugly. By bringing your own dorm room lights to school with you there is no need for you to depend on the ugly florescent lights in your college dorm room. 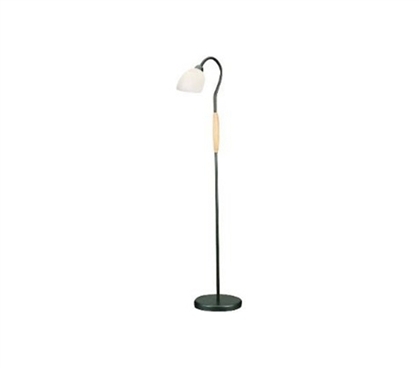 So whether you love the outdoors, or just need some quality dorm room lighting, add our Natural Body Wood Floor Lamp to your college supplies and say goodbye to florescent dorm room lights.